The DIGI Single Plate Direct HIU…following in the footsteps of the DATA, the most efficient HIU ever made. The DIGI HIU uses the latest electronic stepper motor controls to provide both DHW and central heating. 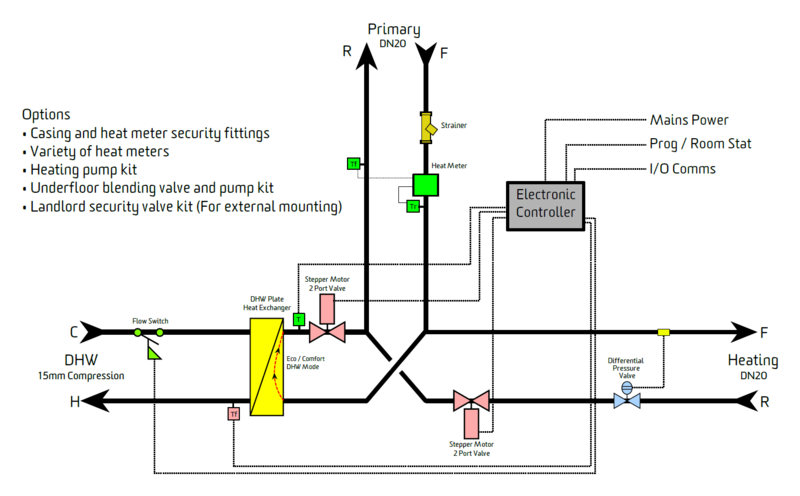 Central heating is provided directly, with a Differential Pressure Valve fitted on the CH feed. 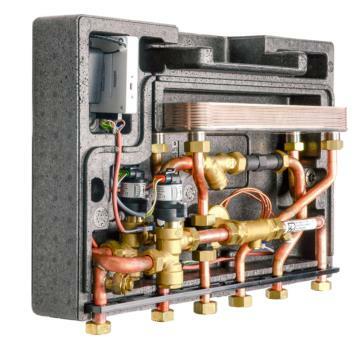 The double wall DHW heat exchanger provides complete protection from cross contamination in the case of a plate failure, thereby meeting the most demanding European regulations. The unit comes in an attractive EPP casing, with overall dimensions of only 570mm (W) x 390mm (H) x 170mm (D), and remarkably low heat losses less than 10W. All connections are bottom entry, with a European standard first fix rail as an optional extra. The first fix rail spaces the unit 50mm from the wall to allow pipes to be run up the back.